ye-travels.org: Yann & Emilie's travels: Naadam! Mörön was an extremely pleasant place to discover (despite advice to the contrary in our guidebook). With just over 35,000 inhabitants it is the northern province of Khovsgol's capital. The July weather in Mörön was dry and warm in the day and refreshingly cool in the evenings. 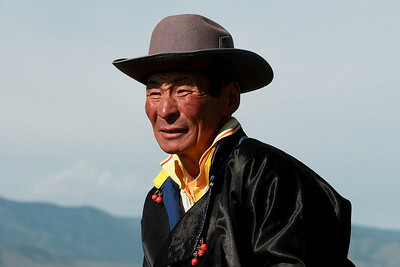 Our arrival in Mörön coincided with the beginning of regional Naadam festivities. 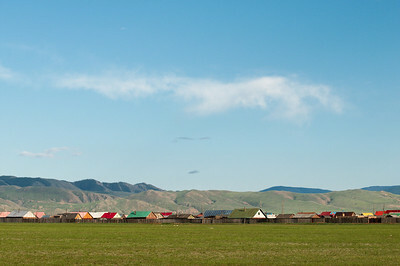 We hadn't planned to stay in the city, but we decided that, given the few foreign tourists, it would be an ideal place to watch the horse riding, archery and wrestling that mark Mongolia's most important national event (Naadam translates literally to "games"). Along with everyone else in the area, we headed to the fields outside of the city two days in a row to participate in the excitement and joy of Naadam. Arguably the festival's most important event is the wrestling tournament. On day one we seemed to be watching the preliminary rounds, where the serious wrestlers had to contend with drunken challengers from the audience on their way to the next day's final rounds. Mongolian wrestlers are huge and scantily-clad. They were a cropped vest attached by a string at the front, covering only their shoulders and leaving their chests exposed. Along with their vests, tight fitting briefs and a pair of ornate, wrestling boots. Before every match, the wrestlers perform a ritual dance, imitating a falcon. In the preliminary round of wrestling, several matches took place at once. We often watched six men as they danced together before facing off. 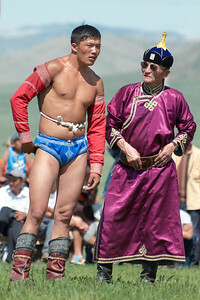 There are no weight or age categories in Mongolian wrestling, but no matter how mismatched the competitors, the wrestlers performed their dance with the same seriousness. In order to win a match of Mongolian wrestling, you must have any part of your opponent's body, other than his feet, touch the ground. During the match, each wrestler is assigned an on-field coach, a zasuul, who holds the wrestler's cap while providing encouragement and strategic tips to his competitor. The more enthusiastic zasuuls liked to slap their wrestler's thigh as they shouted encouragement. On the second day of the tournament, the big important competitors faced off in the final rounds. Unlike the previous day's matches, the competitors tended to be closer matched (challenges from the crowd no longer permitted). When the winner was crowned, he was immediately rushed by the spectators (touching the winner brings luck until the next Naadam). The event that seemed to draw even more excitement was the horse-racing. As spectators we were completely unprepared for this event. All we were told was that there would be three races, classified only be age of horse. There was much excitement about the races involving young horses, as they would be wilder and speedier. We followed the crowds as they made there way to the outskirts of the festival grounds, many of the spectators sat on their own horses to wait for the racers. The crowd got excited as the first horses appeared in the distance, dust clouds on the horizon of the steppe. As they approached, we noticed the jockeys, a sight we were not expecting: young children. 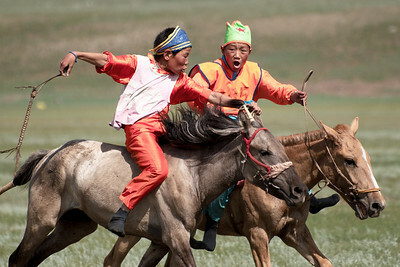 Exhausted little bodies spurred on their horses for the final few hundred meters of a 25 kilometre cross-country race. Some of the horses sprinted by, others trotted in slowly, their behaviour seemingly unrelated to the energy or instructions of their riders. 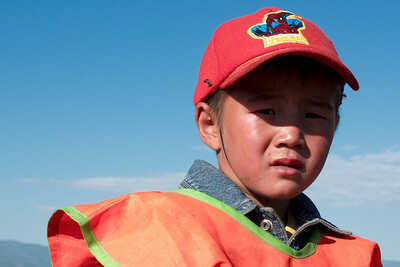 As they completed the race, the faces of the young riders showed pride but many seemed stunned. Riders were joined by their family members, usually with hugs and congratulations. Some young riders sadly were met with anger and obvious displeasure. The situation was upsetting to us and I had trouble holding back tears. I couldn't decide if the event was heart-warming or saddening, although in an event dominated by men, the few girls who competed were definitely inspiring. Children continued to trickle in over the finish line and we stuck around to encourage them as the crowd thinned. Like with the wrestlers, spectators pursued the young winners as they crossed the finish line, eager to get a little piece of good luck. Unlike the wrestlers however, people agitated to touch the winning horse and not it's jockey. 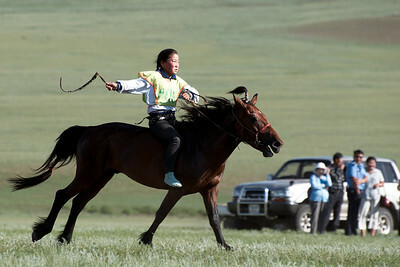 The horse is deemed the winner of the race the rider's performance is of little consequence. We watched the winning horses, led by their tiny jockeys, as they disappeared into a greedy crowd of well-wishers.